© Vachharajani et al. ; Licensee Bentham Open. Tunneled dialysis catheters (TDCs) are an important form of hemodialysis vascular access. These devices are generally placed through the right and occasionally through the left internal jugular veins. Both ultrasound and fluoroscopy are recommended for catheter placement, ultrasound to identify and guide cannulation of the target vein and fluoroscopy to guide tip placement and positioning and to detect technical problems that can interfere with catheter function. Successful TDC placement begins with passage of a guidewire into the superior vena cava. However, occasionally this device enters the wrong vein. In these cases, it is important for the operator to recognize the errant path of the guidewire and make necessary corrections. When the vein is either the ipsilateral subclavian or the contralateral brachiocephalic, the situation is immediately recognizable because of the course taken by the guidewire. However, in some cases, especially those with central venous stenosis, the guidewire may enter the azygos vein, a left sided superior vena cava or, if the carotid was cannulated, the aorta. In these cases, the problem should be made immediately obvious by the position of the guidewire. It should also be recognized that there are occasions in which the problem is not recognized until a catheter has been inserted. This is especially true for a catheter in the azygos that is referred to the access center because of dysfunction. Firstly, it is important to recognize the normal position of a guidewire (or catheter) in the superior vena cava (Fig. 1). The course followed by the correctly positioned device within the superior vena cava is vertical and lateral to the vertebral column, in the lateral portion of the mediastinum . 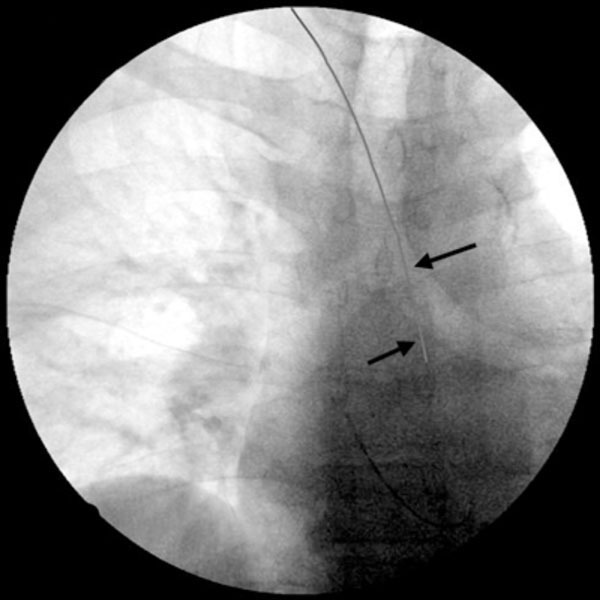 When viewed in a lateral projection, the course of the device is in the mid-mediastinum, in a relatively straight line from the internal jugular and the brachiocephalic veins (on the right). Right internal jugular guidewire (arrows) in superior vena cava (Guidewire has been enhanced for easier visibility). The azygos vein enters the thorax through the aortic hiatus in the diaphragm, and passes along the right side of the vertebral column to the fourth thoracic vertebra, where it arches forward over the root of the right lung (arch of the azygos), and ends in the superior vena cava, just before that vessel pierces the pericardium. When a device, guidewire or catheter, has entered the azygos vein, it generally serves as evidence that it is enlarged and is serving as a collateral to carry flow that has been affected by central vein stenosis. The device within this vein will be seen to course diagonally toward the midline (Fig. 2A, C) to lie just lateral to the right side of the vertebral column. 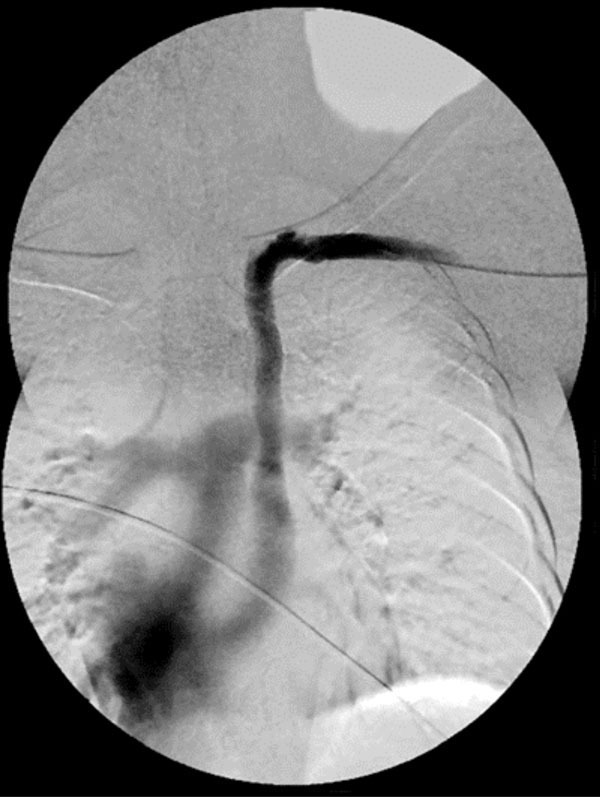 This atypical route is even more obvious in a lateral view (Fig. 2B). The device passes through the azygos arch and courses posteriorly to descend in the posterior portion of the mediastinum . Catheter in azygos vein. A – Catheter from right internal jugular (patient is rotated), B – Lateral view, C – Catheter from left internal jugular placement (patient is rotated). When a guidewire enters a left sided superior vena cava, it is obvious (this is an issue only in left sided catheters). The device passes down the left side of the mediastinum (Fig. 3). Often the first thought is that the brachiocephalic vein has been perforated. This can be excluded by passing a 5 french catheter and injecting radiocontrast. Recognition of this anomaly is very important because the left superior vena cava generally drains into the cardiac sinus and if anattempt is made to pass a guidewire into the atrium, serious cardiacarrhythmias can result. Left superior vena cava (composite view). If the guidewire enters the carotid, its course is also diagnostically typical. The right carotid parallels the internal jugular vein. The pathway from the carotid is then into the thoracic aorta at the arch. The aortic archpasses over the right and behind the left pulmonary artery and then descends. As it descends, it is situated to the left of the vertebral column; it approaches the median line as it descends. A guidewire that is inserted into the carotid and advanced will follow this path as it enters the thoracic aorta (Fig. 4). The device crosses the mediastinum diagonally (from the right) and passes down the left side of the mediastinum to the left of the vertebral column. It is very important that this typical pattern be recognized before inserting something larger than the guidewire into the carotid otherwise a manageable error might develop into an unmanageable problem requiring surgical intervention. Guidewire inserted in right carotid artery (arrows) following course of artery and continuing into the thoracic aorta (guidewire has been enhanced for easier visibility). The guidewire or the catheter’s course as it passes through the vascular structure into which it has been placed has a diagnostically typical pattern. It is important that the interventionalist working with dialysis vascular access be able to recognize these patterns. Heitzman ER. Radiologic appearance of the azygosvein in cardiovascular disease. Circulation 1973; 47: 628-34. Pua U. Radiographic features of malpositioning of a hemodialysis catheter in the Azygos vein. Am J Kidney Dis 2010; 55(2 ): 395-8.